At Dentistry on 7th, we understand the importance of staying up-to-date on technological advances in dentistry and related industries. It is with great pride that we use the latest dental technology to ensure quality, efficient and effective dental work. We are a family dentist in Hamilton committed to providing you and your children with a wealth of services to ensure optimal dental and orthodontic health. Get in touch today to learn how we can help you! We utilize our modern dental technology to provide various services and to ensure comfort and efficiency whether you come in for a routine checkup or a specific treatment. From cosmetic dentistry services to orthodontic services, we offer it all. According to Colgate, the Food and Drug Administration (FDA) in the United States has cleared over 20 different uses for lasers in dental treatment. At Dentistry on 7th, we use an advanced soft tissue laser to help make dental treatments more effective and efficient. This technology is vital due to the precision it provides in procedures that are both common, and uncommon. Using the laser ultimately helps to reduce discomfort, swelling, bleeding during and after treatments, and the general need for anesthesia. The Wand is an anesthetic system that helps our professionals to control precisely where and how much anesthesia is administered before a major procedure. This technology helps us to reduce the pain of injections by making them more comfortable. Because The Wand is a controlled system, the professional administering the injection can use the tool to ensure that it’s slow and steady for optimal comfort. Like The Wand, the Seiler Microscope helps to ensure precise work and examination. The system provides early detection of decay and fractures. These things may be hard to see, but they are felt by patients, which is why it’s vital that we can spot and treat them. You may have a cracked tooth and not see the fracture, which is where this tool comes in. It magnifies the situation to easily identify and treat the problem accordingly before the situation worsens and a tooth extraction is required. According to the Canadian Cancer Society, 4,700 Canadians were diagnosed with oral cavity cancer in 2017 alone. When you visit our Hamilton dental office, our lead dentist Dr. Sarna insists that you undergo an oral cancer screening. Our VELscope® Oral Cancer Screening System detects oral cancer as early as possible so that you can get the attention you need as soon as the condition is identified. This revolutionary hand-held device equipped with fluorescence technology provides an early visualization and a more effective oral cancer screening protocol. The VELscope® can effectively detect both premalignant and malignant lesions. We are happy to answer any questions you may have about this technology that we use to detect oral cancer. We utilize our X-ray technology to provide patients with a point of reference when we discuss any area of concern. One of our favourite parts of this technology is that it allows for minimal exposure time. According to Colgate, a digital X-ray gives off 80 percent less radiation than a normal one. This system is also significantly faster than traditional X-ray printing. When we perform a digital X-ray, the crisp, high-quality image is stored directly in our computer for safekeeping and easy retrieval. It’s safer, faster and more eco-conscious than your average X-ray. Like CAT scans, our Cone Beam Computer Tomography machine provides a 3-dimensional, 360-degree view of an examined area. The technology’s X-rays collect and display a wealth of information including tiny details that couldn’t be extracted by your typical two-dimensional X-ray. With the help of this technology, Dr. Sarna can examine any region from various perspectives at a high resolution. This individualized vacuum system illuminates the inside of your mouth during dental treatments. We use the system to protect your tongue, cheek and jaw when removing a metal filling. It also reduces the mercury vapours released when taking out these fillings. 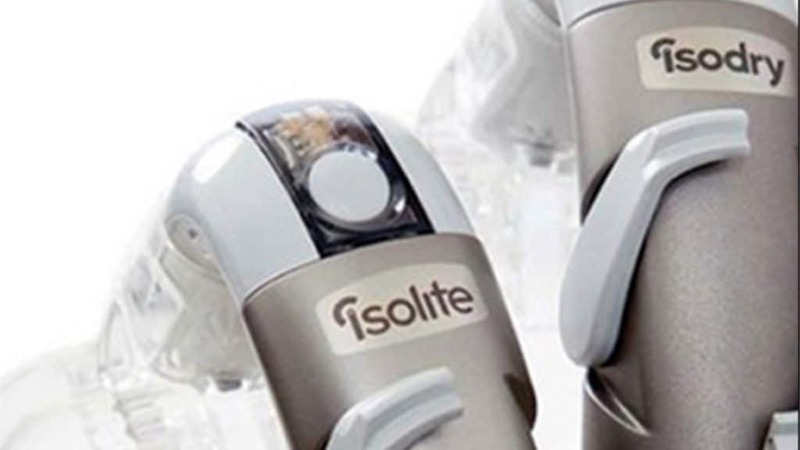 The Isolite Dental Isolation System also helps to keep the inside of your mouth dry so that our lead dentist, Dr. Sarna, can work in a dry space to elongate the lifespan of your dental restorations. We are always using water to clean our materials, which is why it was vital for us to install a water purification system. The technology allows us to ensure that our water is distilled, high-quality and non-corrosive. This makes it perfect for drinking and ideal for cleaning our dental equipment. Our purified water is put to good use at our Hamilton dental office where we use it to make sure all equipment is maintained and sanitary. At Dentistry on 7th, we provide dental and orthodontic services for the entire family. Our lead dentist, Dr. Sarna, is a licenced professional who is best known for his focus on restoring your natural aesthetic through cosmetic, restorative and implant dentistry. Equipped with the latest dental technology and experienced staff, we have the knowledge and resources to help you maintain or regain your oral health. We are proud to be a Hamilton dentist that offers a wealth of services and treatments and are committed to identifying what’s best suited to you and your needs. Give us a call today at 905-963-3693. We are happy to take new patients, all you have to do is book your appointment!